On Feb. 10, from 1-3 p.m., The Elisabeth Morrow School will host a free musical “petting zoo” at the Port Imperial Ferry Terminal, at 4800 Avenue at Port Imperial. 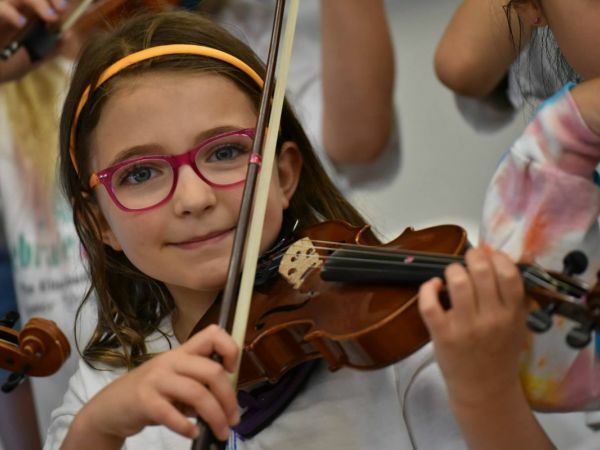 Children can play real musical string instruments with professional music instruction on the instruments of their choice. The event will be commemorated with photos. There will also be a performance from the Elisabeth Morrow School Orchestra. The event will include ice cream, face painting, balloon artists, STEAM activities, and more. The event is free for children of all ages. For more information, contact admissions@elisabethmorrow. In a move that may be a prelude to her running for mayor of Jersey City in 2021, Amy DeGise announced that she will step down from her position as trustee on the Jersey City Board of Education on Feb. 1 to focus on her role as chair of the Hudson County Democratic Organization, to which she was appointed last June. EZ Ride shuttle services will hold an open recruitment on Feb. 12 from 9 a.m. to noon at North Hudson Community Action Corporation, 400 38th St. Suite 214, Union City. Recruiters are seeking CDL drivers for full time and part time positions, with both a.m. and p.m. shifts. Candidates must have a CDL license with a “P” endorsement, and must not have a “Q” restriction. A clean driving record and ability to communicate in English and fill out reports and forms are necessary. Competitive compensation is offered. For more information, call or email Carla Gonzalez-Rios at 201-939-4242 ext. 138, or at cgonzalez-rios@ezride.org. All NY Waterway ferries, which have climate-controlled cabins, operated normally through recent winter storms and low temperatures. Ferries operate 12 months a year. In the rare event when there is ice on the Hudson River, ferries usually keep operating. Weehawken residents are invited to attend an open weight room at Weehawken High School. On Mondays and Wednesdays from 7-9 p.m., the weight room will be open and supervised for students continuing until Mar. 13. There is an open enrollment. No training will take place on Feb. 18. Beginner, intermediate, and advanced art lessons are being offered at Art Room 1 in Weehawken High School. Limited-size classes will instruct groups of ages 13-18 and ages 19+. Classes will take place on Wednesdays from 7-8:30 p.m.; registration is required. On Feb. 11, seniors are invited to a valentine crafting night under the direction of Weehawken Girl Scout Troop 12933, from 6-8 p.m.
Bingo night will take place for senior residents on Feb. 25 from 6-8 p.m. in the Weehawken Nutrition Center at 201 Highwood Ave. Chair Yoga for seniors is a free class in moving meditation. Members practice seated and standing Yoga poses. One class will be held on Wednesdays at 525 Gregory Ave., and another will be held on Fridays at the Senior Nutrition Center at 201 Highwood Ave. Classes will take place from 10 to 11 a.m.
To register for senior programs, call 201-319-6060. The Roosevelt School gym hold open pickup basketball games on Tuesdays from 7-9 p.m., for men 30 and over. Basketball enthusiasts who still want to play in a non-league situation are looking for new members. A photo ID with proof of age, and proof of residency will be checked. Pickup games are open to Weehawken residents only.